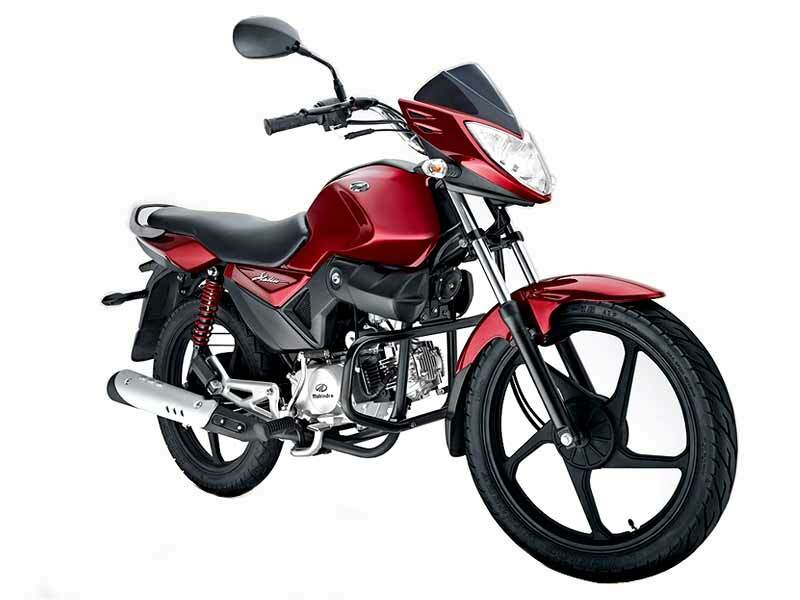 Mahindra Stallio 110cc bike is a recent entry to the product line of Mahindra & Mahindra Limited. Explore the review and check out the price, technical specifications and features of Mahindra Stallio in India. Renowned Indian automaker Mahindra & Mahindra Limited (M&M) launched its two motorcycles 'Mojo' and 'Stallio'. Mojo is a swanky sports bike, while Stallio is a perfect fit for everyday use. Mahindra Stallio boasts of having a powerful 110 cc petrol engine. The high-performance engine promises to deliver good fuel efficiency, while the elegant of the automobile catches instant attention. With fully digital display and high comfy seats, Stallio offers you a comfortable ride. Priced at Rs 41150, Stallio would be a wise choice for the average Indian consumer. At the heart of the petrol-driven Mahindra Stallio lies a powerful 110 cc 4-stroke air-cooled engine, which is high on performance and low on fuel consumption. The engine churns out maximum power of 7.3 PS at 7500 rpm, with maximum torque of 8.0 Nm at 5500 rpm. The automobile has the capability of 'slicing' through obstacles on the busy city roads. It also offers a smooth ride on silky-smooth highways. The stylishly designed Mahindra Stallio is a visual treat! Its 'face' that sports an inverted arrow design is hard to ignore. It grabs the passing glances with its multi-reflector headlamp. The motorcycle offers you fully digital display that comes equipped with speedometer, fuel gauge, tachometer, odometer, trip meter and a clock. With an imposing design, Mahindra Stallio also offers commendable degree of comfort for both the riders. The attractive grab rails are designed for a firm grip, keeping in mind the safety of the pillion rider as well as the style quotient of the bike. You can lock away your bike's papers, keys and other small items in the utility box, which is conveniently positioned under the fuel tank. With snug seats, long rides on Stallio would be truly a wonderful experience! Driving in heavy traffic would not be a nightmare for Mahindra Stallio's riders, because it ensures enjoyable ride and better handling. 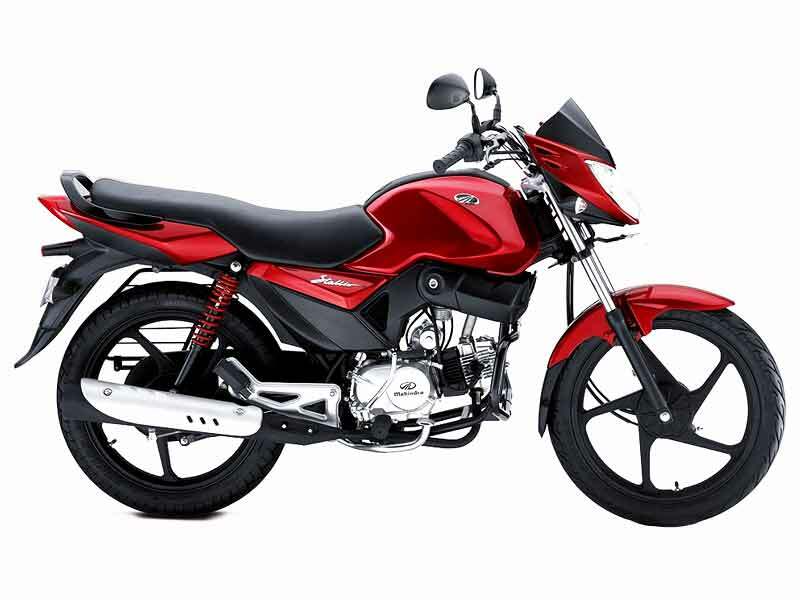 The bike comes equipped with a comfortable gear shift pattern, so that you can effortlessly move down to neutral, direct from the second gear. The vehicle's pro-touch electric start is a plus point. The alloy wheels are especially designed to provide stability while cornering. Whether it is a pot-holed or smooth road, Mahindra Stallio assures you comfortable ride on any prevalent condition. The pair of telescopic hydraulic shock absorbers helps a great deal in absorbing the shock of potholes, thereby avoiding jerk. 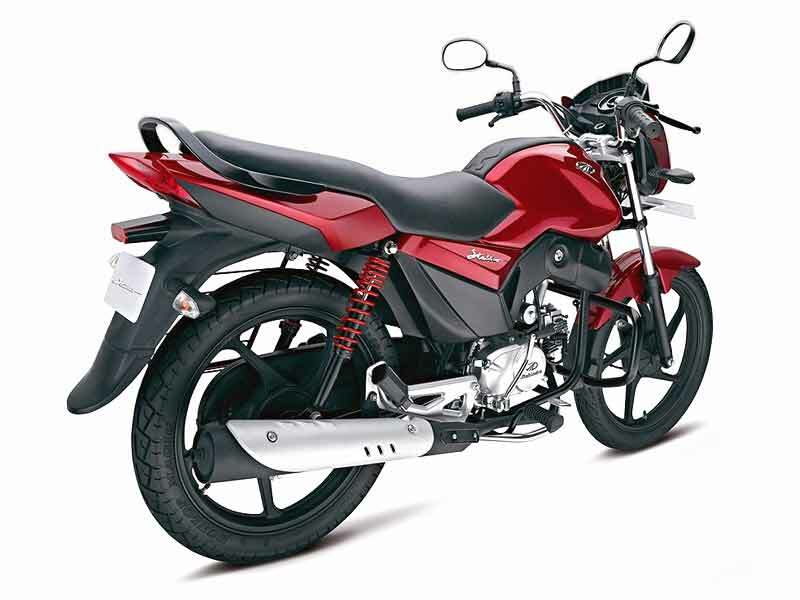 As one of the smart and sporty bikes from Mahindra Group, Mahindra Stallio delivers an average mileage of 58-60 km/l. Mahindra Stallio comes with a price tag of Rs 41150 (Ex-showroom, Delhi). The bike is available in five attractive colors, which includes Derby Red, Buckskin Yellow, Ranch Green, Colt Black and Equus Blue. Front Tyre 2.75" x 18"
Rear Tyre 3.0" x 18"